The DLLR Required Workplace Poster is a general labor law poster poster by the South Carolina Department Of Labor, Licensing and Regulation. This is a mandatory posting for all employers in South Carolina, and businesses who fail to comply may be subject to fines or sanctions. This poster must be posted in a conspicuous place by all employers so that all employees can see it. This poster describes various standards in wages, the restrictions imposed upon child labor, concerns regarding health and safety on the job, how employers should hire immigrant workers and the penalties employers can face if they violate any of this law. SC All-In-One Labor Poster: Instead of printing out dozens of posters, employers can also purchase an all-in-one poster that covers both South Carolina and Federal poster requirements by clicking here . It appears you don't have a PDF plugin for this browser. Please see the link below to download south-carolina-llr-work-place-poster-legal-size.pdf. full amount of unpaid wages, costs, and attorney’s fees in a civil action. No employer in this State shall engage in any oppressive child labor practices. organization, or other person is subject to a lawsuit by the aggrieved worker. For more information, call  803- 896-4470. Carolina employment license which permits an employer to hire  employees. verify  the status of new employees within three business days, using E -Verify. employer or suspension/revocation of the employer’s business licenses. all workplaces, both public and private, within the state of South Carolina. amended, remain under federal jurisdiction. Licensing and Regulation which are applicable to his own actions and conduct . of persons participating in the walk -around inspection. and health in the workplace. contained in Chapter  27, Title 8.
employees of dangers that may  exist. dollars for a non-serious violation. dollars ($70,000) for each violation. Wages and Child Labor at the address and number listed below. There are an additional one optional and mandatory South Carolina labor law posters that may be relevant to your business. Be sure to also print all relevant state labor law posters, as well as all mandatory federal labor law posters. 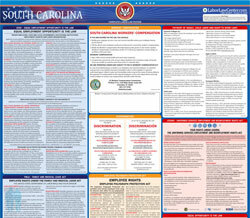 Instead of printing out pages of mandatory South Carolina and Federal labor law posters, you can purchase a professional, laminated all-in-one labor law poster that guarantees compliance with all South Carolina and federal posting requirements. Fully updated for 2019! While we do our best to keep our list of South Carolina labor law posters up to date and complete, we cannot be held liable for errors or omissions. Is the poster on this page out-of-date or not working? Please let us know and we will fix it ASAP. LaborPosters.org will email you a printable PDF of this South Carolina labor law poster, 100% FREE. You'll also get notified when new posters are available. Your South Carolina poster has been downloaded and emailed! This poster download is provided as-is, with no warranty or guarantees. Please verify with Federal and South Carolina authorities to confirm that you are posting all of the correct (and updated) posters required for your type of business. Instead of printing out pages of mandatory South Carolina and Federal labor law posters, you can purchase a professional, laminated all-in-one labor poster.